Tanagra is an idyllic wine farm close to McGregor and part of the Robertson Wine Route and Route 62. They offer comfortable accommodation in well appointed guest cottages, and produce handcrafted wines in a boutique wine cellar and stylish Grappa and Eau de Vie in our boutique distillery. An old wild fig tree gave the farm its name, 'Tanagra' - it echoes the Khoisan expression for a well-shaded place. This giant tree canopies the historic homestead and winery, providing welcoming shade during the hot days of summer. A vibrant Colombard from old vines of a certified Single Vineyard, with notes of fresh tropical fruit and Guava, good complexity and roundness. Dark purple. The nose is very complex with aromas of eucalyptus and tea leaves in harmony with black currant, violets and pencil shavings. After gently swirling the glass you guessed a condiment that is more present on the palate, with rich plum flavors connects and leads to a long-lasting, dry finish. A 16-month maturation in old oak barrels contributes wonderfully in with subtle oak aromas to the excellent overall impression. A rich, deep coloured Shiraz, grown on our north facing slope and produced off our single vineyards. Natural yeast with minimal interference has been used to create this holistic style of wine. Matured in older neutral barrels to round off the wine. Great ageing potential. This beautifully balanced Cabernet Franc presents itself in concentrated dark and red berry fruits. A full bodied red wine with ripe dark berry, plum and hints of spice flavours with soft smooth tannins on the palate and a lingering finish. The whole berries fermented on wild yeast. A 16-month maturation in old oak barrels contributes wonderfully in with subtle oak aromas to the excellent overall impression. A rich, deep coloured blend of Cabernet Sauvignon and Shiraz, grown on our north facing slope and produced off our single vineyards. Natural yeast with minimal interference has been used to create this holistic style of wine. Matured in older neutral barrels to round off the wine. 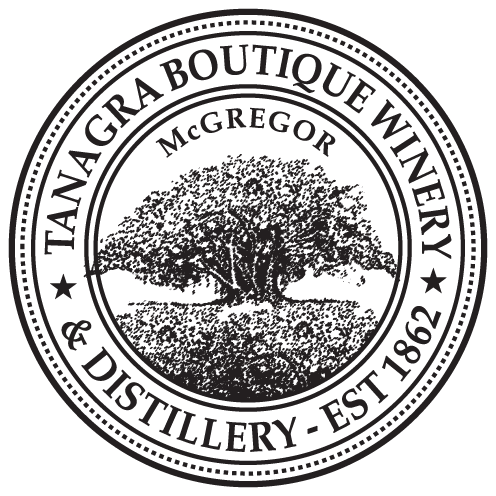 The boutique distillery at Tanagra offers a range of Marc (what the Italians call 'Grappa' and the German call 'Tresterbrand') and Eau de Vie, produced in very exclusive and limited quantities. When relocating from Germany in March 2009 a German 200 litre still was brought along , a combined pot still (copper) and column still (stainless steel). This combination allows to distill in a single process resulting in a purer yield. The philosophy is to use German technology & know-how and only the freshest and best local products to distill fine spirits of distinction. Nose is stunning and gives impression that palate might be sweet, yet it is bone dry. Smooth and dry across with very lively palate. Lemon flavours grows in the mouth and is lifted by firm alcoholic content. Very unusual and pleasant vanilla flavour at the nose. Soft on the palate with the impression of a cedary cassis note. Lovely dry, slightly oily and intensive finish. Very gentle apricot aroma on the nose. Surprisingly soft and fresh, creates a nice flavour on the tongue. Very gentle, subtle and elegant peach aroma on the nose. Surprisingly soft and fresh, creates a nice flavour on the tongue. Displaying very clearly the mineralic, fresh and grassy character of Springfield’s “Life from Stone”. Creates nice volume of freshness on the palate. Intense but still soft with a nice Sauvignon Blanc crisp. Fragrant and delicate Grappa. Surprisingly soft and fresh, without the typical “burn” on the swallow. Flavourful, hint of typical buttery Chardonnay taste. Gentle, fragrant aromat with slight oak and Brandy flavours, yet still distinctly Grappa character. Smooth and soft (even oiliness) across the palate with again the distinct Grappa characters. Builds intensity in the mouth then gives very pleasant warming glow on the swallow. Fresh with a slight, typical Cabernet Sauvignon, Cassis note. Has an insistent, smooth, dry grip on the palate. Strong, fragrant aroma with distinctly Grappa character. Smooth and clean across the palate with again the distinct Grappa characters yet decidedly crisp and clean. Builds intensity in the mouth then gives very pleasant warming glow on the swallow.